It’s not often a National Champion who earned a 450SX podium in the previous season finds himself without a ride, but that’s the position Dean Wilson finds himself in right now after being sidelined earlier in the year with a torn ACL, an injury that’s all too common in this sport. But instead of complaining and feeling sorry for himself, Wilson is hard at work training for the upcoming Monster Energy Supercross season while simultaneously lining up sponsors. We got in touch with him to see how things are coming along. 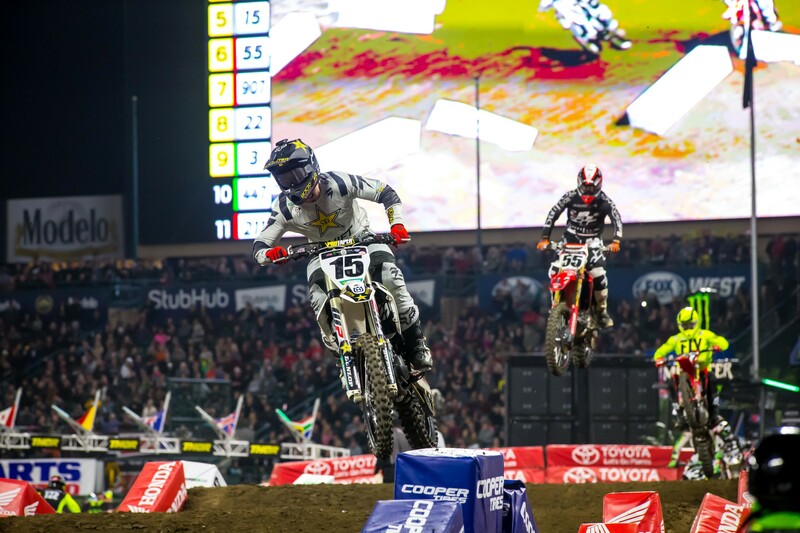 Racer X: How’s the knee? Dean Wilson: The knee is actually really good. I’m driving to the track right now. I’m on day three of supercross and it’s good to be back. The knee is feeling good, it’s just been a pretty long road to get back to where I’m at. But the other day on my first day of supercross I was thinking, “I can’t believe I’m back on the track and doing this already, it’s pretty crazy.” I’m feeling good and working hard and it’s a pretty busy time for me right now. How’s the job hunt going? Got anything lined up? No, everything is booked, there’s definitely no factory rides out there. I’m still working on things though and there are details to be worked out. I’m my own agent now, I’m my own trainer, my own nutritionist, everything. I’m trying to do it all and it gets pretty overwhelming at times. It’s very stressful. But I know these are just the beginning stages and I’m trying to organize. I’ll definitely be in a Sprinter van. I want to give a big thank you to Rockstar Energy because they’re sticking behind me and have been very supportive. Also, AGL Grass have been stepping up and helping me. There’s more I’m figuring out and can’t announce yet, but once we have everything set in stone I can announce my plans. I had a few conversations recently with people about underrated riders and your name came up several times. You’re a National Champion and got a podium in supercross last year. Does it surprise you that you don’t have a factory ride right now? It does and it doesn’t. I had a good year-and-a-half to two years without getting injured, then I got injured again. I get it, teams get scared to pull the trigger on someone who could potentially be out, and with my record I definitely understand that. But what was tough for me, I thought there was kind of a chance I was going to be on the Rockstar Energy Husqvarna Factory Racing team. I kind of waited all summer for the answer and it kept getting postponed. But the three-man team just didn’t get approved. They only wanted a two-man team, they didn’t want a three-man team. KTM only has a two-man team too. That’s where it left me and there was nothing else available. It’d be very easy to be bitter and mad, but to be honest, the best thing for me to do is to focus on my riding and training. It adds a lot more stress trying to organize things for next year, but I have enough good people around me to where I believe I can still do really well and compete at the top level. Speaking of that stress, you’ve been here before. Last year you were in a similar position. Does that experience make it any easier this time around? I thought it would, but it’s actually more stressful this time because I’ve got serious sponsors who are involved and helping me. There’s a bit more thought put into the privateer program this time, whereas before it was just going racing. We’re pretty much going to do the same thing, but it’s a little bit different with sponsors helping me. I also had my agent helping me last time and now I’m just on my own. That’s probably the most stressful part, that stuff. I’m not very educated at doing that stuff so it’s a big learning experience for me. But it makes me a better person in the end. A lot more office time? Yeah, I’ve been in the office a lot lately. By the time Anaheim 1 comes around I could look like Grandpa Earl for real.